A few years ago, C made us a punching cradle out of wood recovered from a fruit crate. This tool helps you punch the holes through the fold of the paper with more precision, since you just lay the open signatures inside it an punch downwards with the awl. It has been a big help in our bookbinding adventures, it is very sturdy and doesn’t take a lot of storage space. 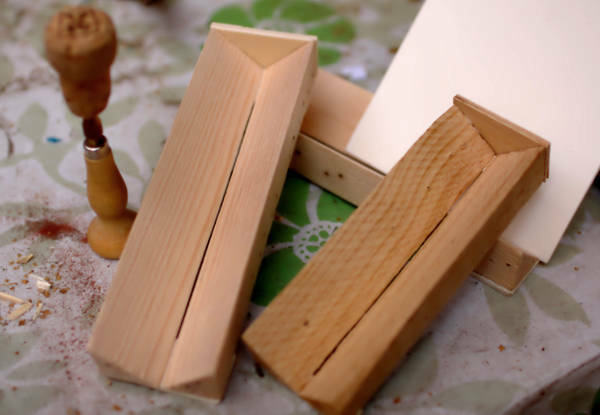 Recently I decided that I needed to have more to be used in our bookbinding workshops. Even though the cradle is only 16 cm long, I have used it for punching books of up to A5 size without problems. Now that I have several, I can imagine placing two side by side to make books up to A3 size! I also came across a bigger veggie crate that provided me with 20 cm pieces! These boxes are pure (cheap and wooden) gold. I decided to take a few pictures of the process, and do a little write-up on how to make the cradle. It is so easy, I didn’t take as many pictures of the process as I should have! I hope it is clear enough like this. wood glue or strong craft glue. scrap paper (to protect table surface from glue). First of all, we have to disassemble the wooden crate to get to the corner pieces we want to use. 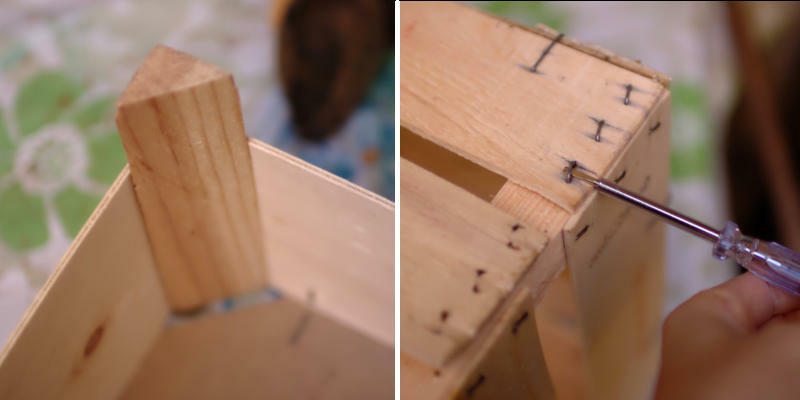 To do this, just slide the screwdriver under the staples and use the screwdriver as a lever to pull the staples out. There are many of these (my boxes had 14 staples for each corner piece! ), but the plywood is really soft and this should be considerably easy. You might need to pull them out with the plyers.Wear gloves if you want to avoid accidentaly scratching your skin or getting splinters! i. This is the corner wedge piece we need. ii. Using the screwdriver as a lever to remove the staples. If the surface of the pieces we recovered is rougher than we would like, now is the moment to smooth them out a bit with sandpaper. 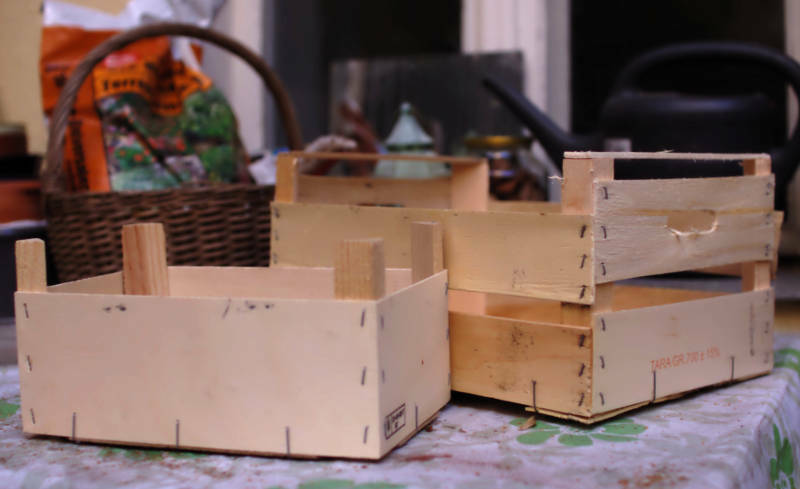 From the two wedge shaped corner pieces, choose the long sides that are straighter and place them side by side, leaving a 1.5-2 mm gap between them. 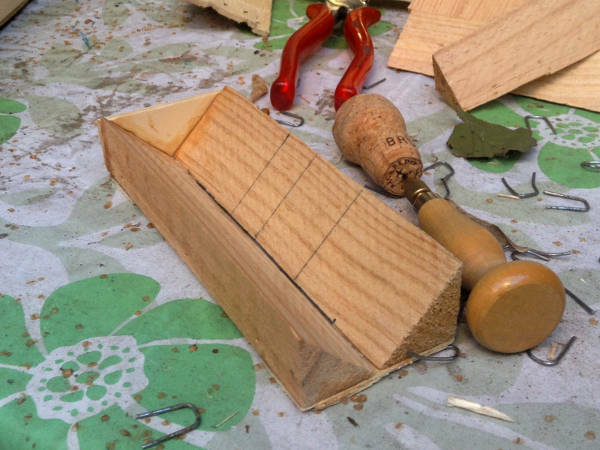 This is almost how your cradle will look once it’s finished, so you can use the finished pictures as reference (sorry I didn’t take a picture of this step!). Now take some measurements. The width (W) of the cradle, as we laid it in the previous step, and the height (H) of it. Keep in mind that if you are reusing materials, it is possible that the measurements are not regular, and for example the height is not equal at both ends. In this case, just do an appoximation. This is not a rocket we are building! Cut three pieces of plywood: one back piece that is W by H plus the thickness (T) of the plywood, and two bottom pieces that are as long as your W and 1 or 2 cm wide. The cutter knife should be enough to cut through the plywood. i. Diagram of the parts and measurements mentioned. ii. Starting the gluing. Place the two bottom pieces on your table. Put some glue on them, avoiding the center, which will remain uncovered. 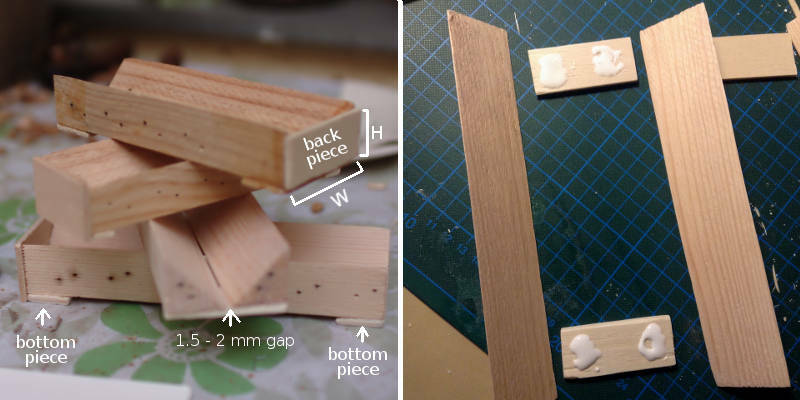 Now place the two long wedge pieces in place on top of them and adjust their position so the bottom pieces are on the ends and there is a regular 1.5 – 2 mm gap between their long edges. Luckily, wood and craft glue stay wet for some minutes so you can readjust their position until you are satisfied. Make sure the edges are flush on one end, where we will glue the back piece. Let it dry a bit before putting some glue on that end and place the back piece there. Put the cradle down on the table to make sure it sits flat. The back piece goes only on one side so that we can use bigger signatures than the cradle can hold, letting the paper go over the other end. Wait for it to dry and it’s ready to use! To use your punching cradle, remember to always align your signatures against the back piece, so that the holes will be completely regular. I think the design could be improved with a wooden punching guide, but so far it has worked really well for me! Please tell me if you make one and how it works for you, I’d especially like to know how it compares to other models since this is the only one I’ve ever used. PS: Please, feel free to point out where my instructions might not be completely clear. Writing a tutorial is much more difficult than I expected!